Royal Respin Deluxe – ALMOST 1 MILLION SPINS! We are not at all surprised! It’s a hit! But, we will be honest and say…we were blown away by the number of players and amount of spins that you guys have done since last week. ALMOST 1 MILLION SPINS! A a “new classic” 3-reel, Bar-7’s machine where you can play with 1, 5 or 9 paylines here at Fly Casino. On the reels you’ll see classic beloved single, double and triple bars as well as red and green lucky 7s. 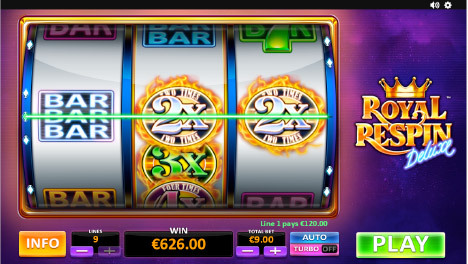 On the reels you will also find lots of 2x, 3x, 4x and 5x multipliers! The BEST is if you land more than 1 multiplier on the same spin as the payouts can really start to go up and up. The 2x wilds can land on all 3 reels. The 3x, 4x and 5x wild multipliers appear on the middle reel only. The main bonus feature is the Royal Respin feature – this is triggered by landing a wild multiplier on the 2nd reel in the middle of reel. The wild (or wilds) from the respin will be held during the respin giving you a second chance at a big win. We played if for hours and the screen shot shown was landed just 10 minutes into our play at our flagship Omni Casino. 2X, 3X, 4X AND 5X FLY CLUB POINTS – CASH! We’ve got a great promotion for you! Play any of the slots at Fly Casino on Wednesdays in August and you are GUARANTEED to win anywhere from 2,3,4 or 5X Fly Club Points earned for that day! YOU CAN WIN UP TO €/$/£200.00 CASH! You’re guaranteed to win every week for play between 00:00GMT - 23:59GMT each Wednesday in August! Point Multipliers are randomly drawn and then paid on Fridays in CASH! Prizes are rounded to the nearest whole unit of currency. $50 gets $75.00 X 2! On Sunday from 00:00GMT until 23:59 GMT, all members on their deposit of just $/£/€50 or more will receive a $/£/€75.00 bonus. Claim 2X. 120% Up to $120.00! From 00:00GMT until 23:59 GMT, all members on their deposit of $/£/€30 or more will receive a 120% bonus up to $/£/€120.00.